BPA via Getty ImagesPresident of the EU Commission Jean-Claude Juncker, President Donald Trump and Russian President Vladimir Putin in Germany. President Donald Trump’s top administration officials struggled Sunday to clarify his position on Russian meddling in the 2016 election — as Trump himself muddied the waters with his tweets on the subject. Trump said Sunday that he asked Russian President Vladimir Putin during their meeting Friday whether Russia played a role in hacking and leaking private emails from top Democratic officials last year, a conclusion supported broadly by the US intelligence community that Trump has publicly doubted as recently as last week. In a Sunday interview on “This Week,” ABC host George Stephanopoulos asked Treasury Secretary Steve Mnuchin three times whether the president believed Russia meddled in the 2016 election, a question the secretary refused to answer outright. “You say he’s made it very clear how he feels,” Stephanopoulos said. “But we all saw that press conference earlier in the week in Hamburg where the president said about three different things on whether or not Russia meddled. He said I think it was Russia. I think others did it. No one knows for sure. “What is the president’s position on whether or not Russia interfered in the election? Does he accept the conclusions of the intelligence community?” he said. Though she forcefully argued that “everybody knows that Russia meddled in our elections,” Haley dismissed questions about whether Trump believed Russia meddled in the election, saying that people were “trying to nitpick” Trump’s statements. 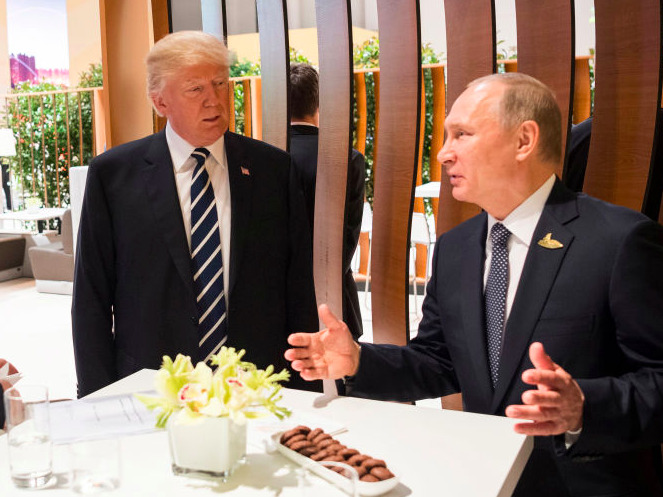 Trump officials hoping to move away from discussions about Russian meddling weren’t helped by Putin, who stoked doubt by saying that Trump seemed “satisfied” by Putin’s denial that Russia interfered in the 2016 election. Asked on “Fox News Sunday” about Putin’s description of the meeting, Trump’s chief of staff Reince Priebus pushed back, saying Trump believed Russia interfered in the election. Trump seemed to further complicate his message on Sunday by announcing discussions of a joint cybersecurity task force with Russia, a move that provoked immediate criticism from Democrats and Republicans who questioned Trump’s willingness to accept that Russia would act in good faith. Republican senators Marco Rubio and Lindsey Graham agreed.